The original Vivid Giya G1 debuted at CES 2008 with a launch party at the Mirage held by Philip O’Hanlon of On a Higher Note, then the U.S. importer, and I was fortunate enough to attend. With design and business offices in the UK, and manufacturing facilities in South Africa, Vivid Audio represents the latest conceptual realizations of designer Laurence Dickie. You may recognize the name, as Dickie is the designer of one of the most iconic loudspeakers ever created, the Bowers & Wilkins Nautilus. Once you’ve made that connection, the style and aesthetic of the entire Vivid lineup should start to make a lot more sense, as they are all the logical development of that unique concept. Born in England in 1960, from an early age Dickie expressed strong interests in natural sciences, often taking things apart to see how they worked. Throughout his youth, he found himself continually distracted by the intrinsic beauty of the graphical results of mathematical operations, and was as comfortable with arts and crafts as he was with more academic subjects. Shortly after graduation from Southampton University with a degree in electronics in 1981, he moved to Nottingham. But it was his joining B&W in 1984 to help develop active speakers that heralds the beginnings of what would become Vivid Audio. In 1986, while working on cabinet materials for B&W, Dickie hit upon the notion of filling the enclosure with a network of perforated partitions which would rigidly support opposing walls. Shortly thereafter, in 1987, B&W patented the Matrix system. 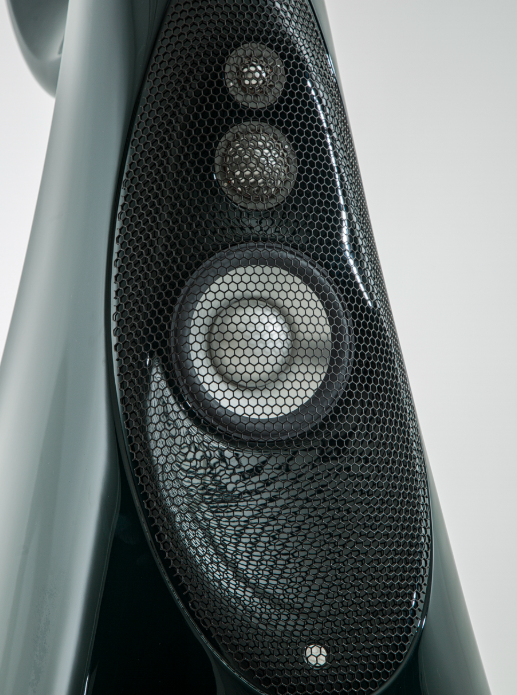 John Bowers was impressed enough that Dickie was permitted considerable license developing new approaches, one of which eventually led to the 1991 prototype Nautilus speaker system, shown for B&W’s 25th anniversary. Its form was very much dictated by mathematical rules governing acoustic operation, and the following year was spent refining the industrial design, with assistance from Alison Risby of the Brighton College of Art. In 1993, the production Nautilus was a reality. Dickie soon found himself working in the pro-audio world and began exploring the potential of horn loudspeakers. Leaving B&W in 1997 to pursue the development of a range of high-efficiency drivers for studio monitors, he spent the next few years developing transducers that would eventually become the Vivid Audio D26, D50, and C125. Continually frustrated by an inability to use exponential tube absorption in a bass-reflex enclosure, he decided he needed to learn computer-aided 3D design. From 2006 through 2008, he went through numerous wooden prototypes to test bass loading before eventually hitting upon the combination that would become the basis for Giya. In 2008, Vivid Audio was launched with the unveiling of the original Giya G1, which remained the company’s flagship until last April, when the Spirit was introduced in the U.S. If you’ve ever seen one of the Giyas, you’re not likely to forget its appearance. I’d also go so far as to say that you also likely had a strong positive or negative reaction. From the front, they resemble a large bowling pin; from the side, they have a swirl at the top almost reminiscent of the curl you’d find atop a soft-serve ice cream cone. The most immediately visible difference between the original G1 and the new Spirit are in its form factor. Though only four inches shorter and three-quarters of an inch deeper, the Spirit is slightly wider, and appears even more so because of its lower overall profile and the lowered driver array on the front baffle. As is the case with all Giya enclosures, the Spirits are fabricated of a very light but stiff, glass-reinforced, balsa-cored sandwich composite, and my review models came finished in a gorgeous metal-flaked midnight blue. This deliberate application of light-yet-rigid materials was chosen by Dickie to drive enclosure resonances to higher than normal frequency ranges, where, Vivid contends, they become less apparent. This is in direct contrast to many other manufacturers today who use aluminum or some dense constrained-layering technique to get a high-mass enclosure, typically incorporating a large essentially flat front baffle and eight more-or-less squared corners. Rather, Giyas are continuously contoured, with elegant curves in a fluid and sweeping design without a single corner anywhere to interfere with driver radiation patterns. The lack of any flat baffle or sharp edges translates to a lack of interference and an amazingly smooth off-axis response. And, at five-foot three-inches tall, each Spirit seems surprisingly light, weighing in at just over 175 pounds! This is possible because the Vivid design alleviates the need to restrain or prevent the otherwise reactive motion created by large woofers moving in phase with each other on a single, rigid front baffle. One of the key design features of the entire Giya series is the use of a pair of opposing woofers, mounted low on the inner and outer sides of the enclosure. They are firmly connected to each other via a solid tensioner mount, using a system Vivid has dubbed a Reaction Cancelling Compliant Mount. Because they are back to back, and mechanically connected to each other, running them in phase, so that both woofers are moving outward, and then inward at the same time, they work to cancel each other’s mechanical motion against the baffle, in effect neutralizing the need for an ultra-solid mechanical baffle to hold them firmly in place.